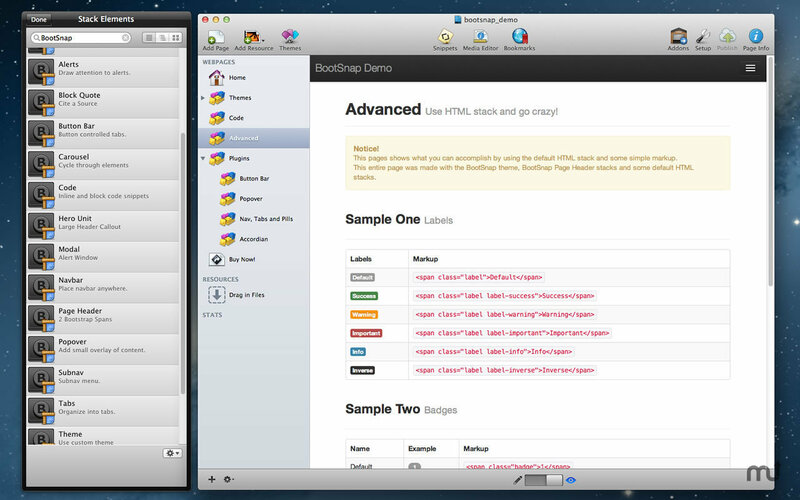 RapidWeaver stack and theme; add the power of BootStrap to your site. Is there a better alternative to BootSnap? Is BootSnap really the best app in HTML category? Will BootSnap work good on macOS 10.13.4? BootSnap is a killer combination RapidWeaver Theme with 15 Stacks that add the power of BootStrap, from Twitter, to your RapidWeaver site. The theme and stacks work together to setup a fully responsive environment -- this means your site will look great on all browsers and devices. Images and text just look *right*, no matter the visitor's platform. BootSnap needs a review. Be the first to review this app and get the discussion started! If you're already using Stacks 2, you'll find that BootSnap is a breeze. Just choose BootSnap theme on a Stacks 2 page and add BootSnap content stacks to your site. BootSnap brings an end to the days of designing both a desktop site and mobile friendly site and relying on browser detection scripts to route traffic appropriately. Simplify things and design ONE site and BootSnap will do the rest.